This is the first documentary that I’ve reviewed, which is a new thing for me. Like I’m not sure how to review a documentary the same way I’d review a movie or a book. It’s kind of hard, I can’t talk about the acting or the writing or whatever, since it’s not a scripted program. My first instinct is, what do I say? “It’s a documentary about ____, so if you’re interested in _____, then you should watch it.” That’s what’s taken me so long to get to this, even though I bought it a few weeks ago. But I’m going to give this a shot because it was filmed by Brandon Easton, a writer whose work I’ve covered before, and it’s about a subject which I’m very interested in, it’s why I set up the category on Chacebook for Indie Comic-books of Color and something I think more people should care about. So this documentary, which is about an hour long, is narrated by Easton, who never actually appears speaking on camera, although pictures of him are shown on the screen, discussing his background and love of sci-fi and comic-books and his efforts to write his own stories and break into the industry. While the overall theme is sci-fi and fantasy in general, the documentary does spend the most time on comic-books and those who create them. He’s assembled an impressive group of creators, some whose work I’m familiar with and others that are new to me (but won’t be for much longer), that he talks to throughout the documentary, which is broken up into segments, with different creators being introduced in each segment and then some returning in further segments to speak on that particular subject. First up, after discussing his own introduction into the sci-fi/spec-fiction/comic-book genres, he talks to creators ANTHONY MONTGOMERY the actor from Star Trek: Enterprise who also published his own comic MILES AWAY, TONY PURYEAR and ERIKA ALEXANDER the married couple who produced CONCRETE PARK, GEOFFREY THORNE whose written for TV, novels, and comic-books, JOSEPH P. ILLIDGE a former editor at DC and Milestone, ENRIQUE CARRION who wrote VESCELL, and novelists N.K. JEMISIN and NNEDI OKORAFOR. It’s interesting to note how similar most of their stories sounded, all becoming interested in fantasy and sci-fi as kids. Montgomery and Thorne were influenced by Star Trek and its Utopian color-blind future, Illidge was engrossed by the soap opera aspect of the X-Men, and so forth. I loved Carrion’s answer that for him it was Optimus Prime that most intrigued him as kid, because OP had no “race” or skin color, he was just cool. In the 2nd segment BREAKING IN, we’re introduced to writers VINCENT MOORE, JOHN JENNINGS, and DANI DIXON as they and others discuss the struggles of getting into the industry and making your voice heard. THE POLITICS OF BEING A BLACK CREATOR was another particularly interesting segment, as the various writers (including ROBERT ROACH, HANNIBAL TABU, and DEWAYNE COPELAND) discuss the issue of do Black writers have a special responsibility to write stories with predominately (or all) Black characters? Or should you strive to be “universal”? STARTING A BUSINESS focuses mainly on the creation of LION FORGE COMICS, whom Easton and Thorne have written for. We meet President DAVID STEWARD II and writer DAVID GORDEN (check out Quincredible, y’all!) and they discuss what went into the formation of the company and how they approach publishing, and why they decided on the digital-only model that they use. THE INDUSTRY is the segment dealing with Hollywood and the publishing industry and what it takes to survive and thrive in it. And it includes some frank talk about the racism and sexism that they’ve experienced. Copeland talked about a meeting he had years ago with a movie producer regarding a Wonder Woman script that Copeland wrote, but once they had a face to face meeting and the producer saw that he was Black, Copeland could tell how the man’s whole vibe changed, and he never even read the scipt. Illidge talked about editing the Birds of Prey series at DC and the conscious effort he made to have the Power Girl character not drawn like the big-breasted blonde he always saw her depicted as, to make her a better character for female readers to identify with, and then how after he left the title she reverted to the previous image. Tabu spoke of his experience meeting the Late Great DWAYNE MCDUFFIE (Peace Be Upon Him) and his advice to Tabu about “not writing all that Black stuff,” because McDuffie was just being brutally honest about how that would turn people off, and that Tabu had to learn to build a following for himself first before he could do that and get people to listen to him. I actually remember Geoffrey Thorne saying something similar on Facebook some time ago. I think he got similar advice from McDuffie. And he used the example of Shonda Rhimes, how it wasn’t until she’d proven herself by creating and writing two hot TV shows with multi-racial casts (but White leads) that she was given the chance to create a show starring a Black woman. That’s how ya gotta play the game. Other writers, like Jennings, express the importance of networking, because it really is who you know. We’re also introduced to and hear from ROBERT ALEXANDER, Erika’s brother who co-created Concrete Park, in this segment. Then WRITING FOR ROOKIES has several creators giving advice to aspiring writers, stressing the importance of not following trends, and being persistent. Both Thorne and Roach separately use the phrase “What else you got?” to emphasize the need for writers to have multiple projects and stories and not just one, because the people in power want to know that you’ve got more than one trick up your sleeve or else you’re no use, no matter how good that one idea is. 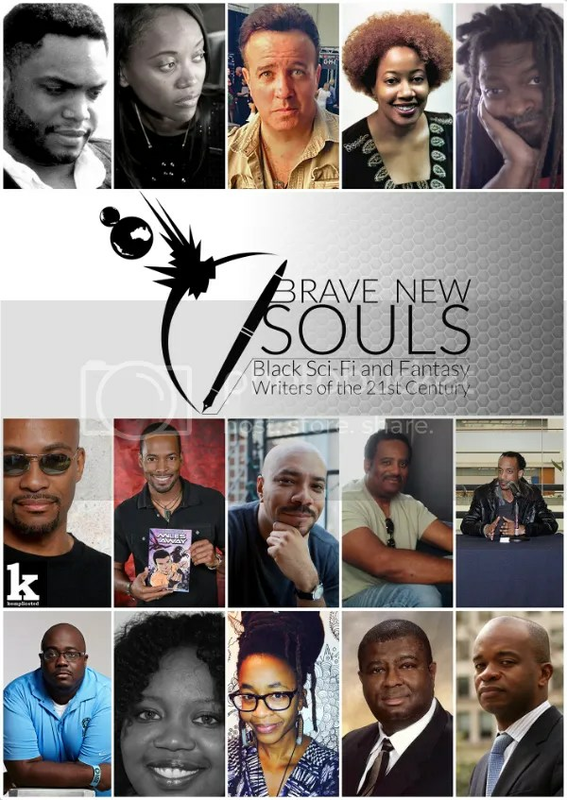 And then finally there’s THE FUTURE OF BLACK SPECULATIVE FICTION where they all talk about the challenges facing Black creators and how they think it’s progressing. All ending in Easton giving a call to arms, so to speak, to Black creators and most importantly the Black fans, about how we can’t sit around for others anymore and need to go out there and do for ourselves and support each other. Buy it NOW for $7.99! The fan part is something I notice as well. We have to put our money where our mouths are and support both traditionally published and indie folks. There are indie authors who are making it big in traditional formats, but that’s because they had so much support when they were independent that the traditional pubs had to sit up and take notice. We can create that kind of ground swell around authors in our communities, but I haven’t seen it yet. The quality is out there. We just have to look for it and trumpet it when we find it, just like over fans do. This just gave me an idea for a blog. Agreed, 100%. Thanks for reading.